You can pay up to $10 for one jar of local honey. That's just one reason why some people are turning to backyard beekeeping. "Anyone can learn it. If you have even a small amount of space you can figure out how to do it," said John Berry. John Berry is a bee consultant. He works alongside fellow beekeeper Betty Heacker. 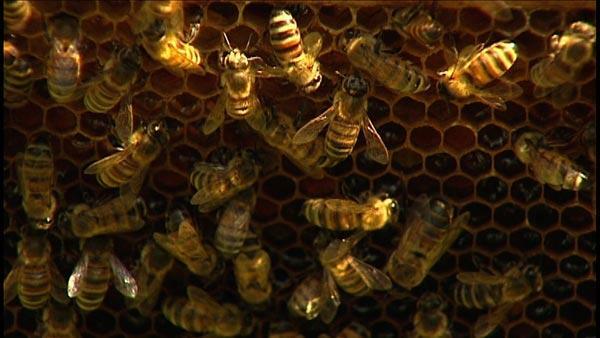 "What we are seeing now is a real interest in backyard beekeeping. I think that's connected to the huge growth in popularity of backyard gardening. It's associated to people wanting to grow their own and have control. To know what was put on that tomato plant. And fresh is always better," said Betty Heacker. There are other benefits to beekeeping besides having fresh honey. "Typically people who have gardens or orchards expect about a 20-25% increase of productivity if they have bees on their property. For backyard gardeners having a beehive is a source of pollination activity," said Betty. "Local honey is also supposed to help your allergies. If you eat honey from close to where you live it's supposed to lesson your allergic reactions. It doesn't take much to get started to become a beekeeper," said John, "Before you get your bees you need to have all the physical parts of the hive that aren't bees ready to go. "The basic starter box which is called the brood body, or hive body and it's about a 9 inch deep box. It holds 10 frames of honeycomb. Once you get the home for the bees, you can order a "starter kit" of bees online, which includes a queen and a group of bees that go with her. Each frame on the box holds a sheet of beeswax called a foundation. It's a sheet of beeswax with a honeycomb pattern on it. they will build out from there. they are attracted to the smell of honeycomb." Once settled in their new home, the bees get to work right away. "Bees never sleep. They work 24 hours a day," said Betty, "They forge during the days and at night they are building wax, they are processing honey." John says another must have for beekeepers is a smoker. "The smoker just calms the bees. It keeps them from being as aggressive as they may be. Sometimes you don't need any smoke. I always give them a little bit." All the equipment needed to start out could run you anywhere from $2,000 to $3,000. But you can quickly make that money back from the honey. "You weigh honey in pounds. One beehive properly managed will probably give you between 100 and 150 pounds of honey, which is 2 to 4 gallons. I want to say honey is about $6-7 dollars a pound - if you are talking about local honey. Let's say it's $6 a pound, 150 pounds that's $900 from one hive," said John. "If there's a lot of crop to work from, they'll make 200 pounds, 250 pounds even from one hive." From fresh, homegrown honey to a more fruitful garden, Betty says beekeeping has given her so much more than just that. "Bees teach you to be purposeful and very present. That's the thing that I just really enjoy about them. It's just a different activity, it's a peaceful activity."